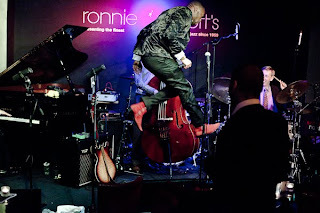 Thursday night saw a heaving Ronnie Scotts bid a very fond farewell to an - as above - already airborne Late Late Show host, Michael Mwenso, who left for pastures new in New York this weekend. London's most prolific musicians, industry folk and jazz fans crammed into the club to hear Mwenso's catchphrase 'That's all folks!' close the party. In his four years spent running the late sessions, first upstairs and then in establishing the Late Late Show in the main club, Mwenso has created a phenomenon that has helped to nurture and support the careers of many of the city's jazz musicians. LondonJazz celebrated the community spirit created by the Late Late Show at Ronnie Scotts on its first birthday last year. Mwenso is popular for his vivacity and powerful stage presence, his encyclopaedic knowledge of jazz and his support for fellow musicians. Through the encouragement of Wynton Marsalis, we hear that Mike has hit the ground running in New York, working with Jazz at the Lincoln Centre and infiltrating the scene across the pond. LondonJazz wishes him the best of luck in his new endeavours. The Late Late Show continues at Ronnie Scotts and will be hosted by Late Late Show regular performers Alex Garnett, Zhenya Strigalev and Brandon Allen. Enjoy Sarah Ellen Hughes full review of Mwenso's last night here. For more pictures, see Jonny Cochrane's excellently captured photo blog here.